Following on from QLD support slots with Texan rockers Spoon and the release of their pyromaniac-friendly film-clip for new single ‘Underground’, Brisbane’s most wayward rock quintet get the second leg of The Underground Tour underway next week. The Underground Tour takes in a dozen dates from the Sunshine Coast to Melbourne. It gives audiences the chance to share in the good times that always seem to find the rabble-rousing bunch who are masters of the sharp, short and colourful rock ditty. Those who like their rock a tad off-kilter, their punk a little clever and their stage antics a lot crazy are encouraged to catch Rocketsmiths as they haphazardly make their way throughout the country, with support on the majority of dates from Melbourne indie-power-popsters Red Ink. 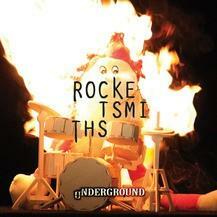 Underground is the new single for Rocketsmiths, a Brisbane based five piece that have been releasing EPs since 2006. With metaphors of the band’s sound leaning precariously towards the more raucous end of rock descriptors (carnie, rockabilly and carnivalesque among them), ‘Underground’ draws on short, punchy riffs and restrained energy to deliver a catchy first single. The track begins with drumbeats tumbling from the silence and quickly ramps up into a tune that would fit right in with those on The White Stripes’ Elephant record. You can’t help but get excited about the youth music scene when you see bands like Comic Sans, The Rocketsmiths and Tom Ugly perform. Hands down the best performance of the night was first support four-piece group, Comic Sans, who are in the throes of recording their first EP. 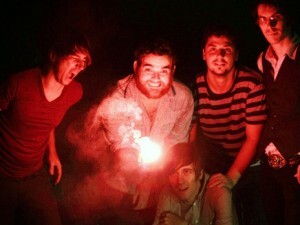 This is a band to watch. Consistently brilliant and musically elusive, they wowed the small crowd at The Troubadour with a commanding display of musical dexterity and sophistication. They give a truly committed live performance that rivets your attention. Exciting; talented; you can’t ignore Comic Sans’ presence; they have the X factor.